The quality of finish and the execution of detail on the present lot are of the highest standard. Quails are auspicious birds because they are pronounced an in Chinese, which is a homophone for 'peace'. Two quails can be read as shuang an, or 'double peace', and thus, these birds appear as a pair on paintings, porcelains and textiles from as early as the Song dynasty. Compare with a few other quail boxes of this type: one in the Palace Museum, Beijing, illustrated in Zhongguo Yuqi Quanji, vol. 6, pl. 106; a pair illustrated by Ip Yee, Chinese Jade Carving, Hong Kong Museum of Art, 1983, no. 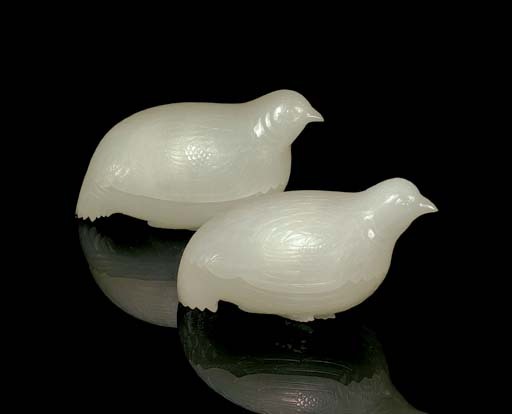 196; another pair carved from brownish-yellow jade, illustrated by James Watt, Chinese Jades from the Collection of the Seattle Art Museum, Washington, 1989, no. 73; and a single white jade example from the Tianhe Shanfang Collection, sold in these Rooms, 30 May 2005, lot 1557.